Local Americana favorites Cactus Blossoms will be playing alongside folk rocker Erik Koskinen in a special night at the Turf this Wednesday. Brothers Page Burkum and Jack Torrey of the Cactus Blossoms are no strangers to the Turf Club, previously having a weekly show to showcase their twangy prowess every Monday night. They’ve been voted the best Twin Cities country band the last two years by City Pages, and with good reason. These brothers can swoon an audience with easily with their broken-heart melodies and their powerful backing band-- even catching the attention of Country Music Television, naming their debut album one of the most overlooked of 2011. Joining them of course will be folk-blues champion Erik Koskinen. His expertly crafted lyricism is sprinkled with heart wrenching metaphors and speak to the common listener. 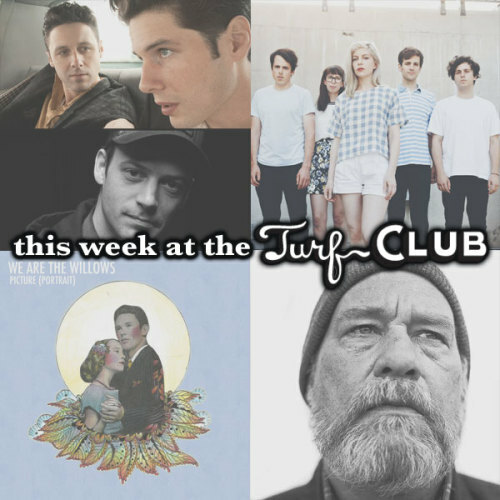 Don’t miss these two fantastic acts at the Turf on Wednesday, a venue that’s made for nights like this. Rising buzzband Alvvays will be arriving at the Turf to perform tunes from their lovely self-titled debut album. It will be their first Twin Cities show to date, as this Toronto five-piece has been hitting the road for the past few months, riding a wave of critical acclaim, and as of recent, been listed on many critics’ top 10 lists for 2014. Their beach-washed indie pop loveliness is irresistible to any listener, with tracks such as “Archie, Marry Me” with the potential of radio airplay on any station. Lead females Molly Rankin and Kerri MacLellan greg up as next-door-neighbors, which leads to musician chemistry that is hard to match. Get your tickets before this hyped indie group sells out the venerable Turf, as they’re sure to be in the Mainroom at some point in their career. The Turf will be hosting a wedding anniversary for all this Friday, featuring some of the Twin Cities’ best homegrown talent. Minneapolis punk veterans Dillinger Four will be headlining the event, a show any Minneapolis music aficionado would identify as a must-see performance. The group is infamous around the Twin Cities, known for being one of the most influential and reckless punk bands on stage. Joining them for this anniversary extravaganza is local four-piece Pink Mink, CityPage’s Picked to Click band of 2010. Pink Mink started gigging feverishly and winning over audiences with their lightning-speed stage presence, unstoppable guitar solos, and terse, poppy songwriting. Their guitar playing is influenced heavily by riot girl bands like Babes in Toyland and Bikini Kill, the melodies are joyous and the lyrics nostalgic, paying homage to Twin Cities classics with songs like "Hidden Beach" and "Seeking Scott Seekins." Whether you know Ben & Sheela or not, this is about to be a classic rock-out night at the Turf this Friday. South Minneapolis group We Are The Willows will be headlining their first Turf show on Saturday night! This indie rock six-piece has been gaining a lot of steam here in the Twin Cities, largely due to their beautiful orchestral arrangements that can be found on many of their tracks, thanks to violin player Leah Ottman and Hilary James on cello. The group has received much praise from indie music sites such as PASTE and Daytrotter. The group crafts dynamic, intimate songs with instruments and voices combining to create beautiful rhythms and intricate melodies. Their heart wrenching arrangements surface nostalgic feelings of love and loss. They also hope to be the first band to perform on the moon. Don’t miss their Turf debut, supporting their sophomore release, Picture [Portrait] Saturday night! Monday night at the Turf will be featuring the legendary, Jon Dee Graham-- guitarist and songwriter from Austin, Texas. A former member of the True Believers with Alejandro Escovedo, Graham is the only musician ever to be inducted into the Austin Music Hall of Fame three times. Graham is most well known for his solo work, including the acclaimed records Escape from Monster Island, Hooray For The Moon, and Full. He is also well known for his tenure in The Skunks-- Austin's first punk band, and roots-rock pioneers The True Believers with Alejandro Escovedo. His sets are filled with emotion, heart, and most importantly a wicked-good guitar legend. Catch Jon and his band next Monday at the Turf!